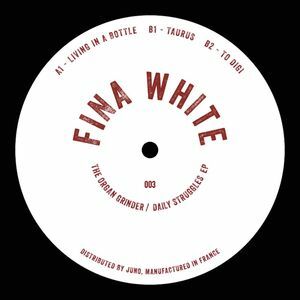 For the latest slice of magic on the evermore impressive Fina White, The Organ Grinder, aka Cayne Ramos, continues with a prolific run of releases which has planted his expansive productions straight in the bags of discerning club commanders like Move D, Brawther, and THE Laurent Garnier. Organ Grinder leads the line with "Living in a Bottle", a classic house number on an MCDE-tip, laced with infectious vocal samples, muffled Rhodesian keys and groovy, beddeddown basslines. There's booming techno in "Taurus" for those who love those big, pulsating kicks, clattering hi hats and deep, penetrating bass tones, while "Too Digi" is a deep cut of tripped out Herbert-esque grooves and vintage keys revolving around an infectious, warped disco vocal.